OUT! Pandya is walking! Rabada bangs it short, Hardik tries to play the upper cut but only manages a faint edge to Quinton de Kock. End of a magnificent knock. He might have missed a century but it has been a great innings. OUT! Morkel breaks the stand! Bhuvi looks to drive a length ball without moving his feet. The ball moves away and the batsman edges it. QDK does the rest. CHANCE! Quniton de Kock has missed a stumping. Pandya was going to give you that chance against the spinner and he did by stepping out and going for the big hit. Maharaj did well to pull the length back a touch, Pandya went for the big heave, missed it completely. De Kock fluffed it. Another reprieve for the all-rounder. FIFTY! Pandya gives a full toll to a flat-bat slap over mid off to get to his second Test fifty. Standing ovation from the dressing room. OUT! 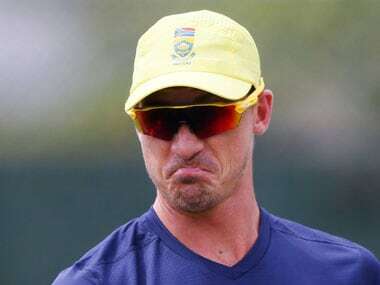 Steyn doesn't get Pandya, instead he gets Saha. Does it all by himself. Saha didn't offer a shot and the ball went straight on, would have crashed into the off stump. Even the review couldn't overturn it. Saha out for duck. India slump further. 7 down. Not even 100 on board. DROPPED! Thick edge from Pandya, straight into the hands of gully fielder and it pops out. Elgar the fielder. OUT! de Kock takes a stunner behind the wickets. Philander is the bowler once again! As another Indian batsmen, chases a wide delivery, Ashwin has to depart this time. Went after a ball that was meant to move away and it did after pitching, got a genuine edge that was straight going towards the first slip, instead it is the man with the big gloves, who pulls of a blinder! Covered the distance of more than 3 meters with his dive. OUT! Ironical! The one who is easily the best batsman in the art of leaving the ball, the one batsman who looked so solid has chased a wide delivery edging it to third slip. Philander strikes first ball after Lunch. India in deep trouble. OUT! The first wicket of the day! Rohit Sharma dismissed for 11. Rabada angles in a pacy delivery on a full length and Rohit gets rapped on the pad. South Africa appeal and the finger goes up. Rohit reviews after a word with Pujara. But to his dismay: three reds and he has to depart. Rabada is pumped up so his captain Faf du Plessis. So that brings us to the end of today's coverage. Hope you enjoyed it as much as Hardik Pandya did in Cape Town on Day 2. South Africa still hold the cards in this match as they lead by 142 runs, but they still have a long way to go as Pujara mentioned in his presser right now that 350 is chaseable on this pitch. But the fourth innings is nine wickets away. The only Indian bowler who impressed today was Hardik Pandya. The others need to turn up tomorrow to ensure that India stay alive in the match. But for now its time to say good bye. A day Hardik will remember for a long, long time. A see-sawing Test still stands even... Hardik Pandya's day of glory this. Has single-handedly kept India in the match with his 93 runs and two wickets in the final hour of play. Without either contribution, India would have been staring down the barrel. Now they can go and regroup in the evening and come back with renewed vigour on day three. There is rain forecast for Sunday so that might be a factor too. One thing is assured... it promises to be another roller coaster day of Test cricket. A dream day for an Indian all-rounder outside Asia in Tests. Very rare. Well done, Hardik Pandya! Shami continues. This will be the last over of the day. Shami tries all the tricks in the bag even attempts a yorker but Rabada survives them all. That will be stumps on Day 2. Bhuvi is back! He bowls all the deliveries on the stumps. Amla even managed to keep a couple out with a late twirl of the bat. Risky but that is what Amla does. FOUR! Poor, really poor. Bhuvi goes very full and Amla flicks it through square leg. Shami comes back into the attack. Probably to get rid of the nightwatchman. He bowls from round the wicket. Rabada survives four balls and collects a brace off the fifth. Only two off it. What a day it has been for Hardik Pandya. 93 runs and two wickets. He has removed both the openers. Dean Elgar never looked in throughout the day. However, he tried to fight hard but perished finally against the angel that Pandya created. India have forced South Africa to send Hashim Amla and here he is. India should try and get another wicket. Pandya has done it for India again... gets Elgar caught behind. What a day he is having... whenever India have been found wanting Pandya has put his hand up. All-rounder indeed! OUT! What a day is he having! Pandya gets rid of Elgar. Angles it on a length and draws Elgar forward. It moves away with the angle and Elgar edges it to Saha who grabs it easily. Wicket number for two for Hardik Pandya. Hardik Pandya is in the game again. What a match he is having! Markram was looking good but he tried to manufacture a shot, got the leading edge and Kumar took an easy catch at backward point. Interestingly, South Africa have sent Kagiso Rabada as a night watchman. FOUR! Pandya himself is disgusted with that delivery and lets out a huge roar. A juicy half-volley on the leg stump and Elgar clips it away to the deep midwicket fence. Ashwin loops it around off, Elgar leaves it watchfully. He guides the second ball behind short third man for a brace. Then he takes a single past short leg. Rabada edges his very first ball against Ashwin but it dies on Kohli, who immediately signals that it wasn't a clean catch. Ravichandran Ashwin comes into the attack. A wicket out of nowehere. Can India strike once more before stumps? Markram is the man to fall. Four runs and a wicket off the over. That last comment jinxed it for Markram... Pandya cannot do much wrong today can he? India have the first wicket. Markram looked very good. Sort of thrown it away. Can India get one more before the end of play. Night watchman Rabada is in. Interesting. India didn't use any nightwatchmen when Virat Kohli's turn came. OUT! Hardik Pandya and Bhuvneshwar Kumar again! Pandya snares the wicket. Bhuvi takes the catch. These two have literally owned the Test so far from the Indian perspective. Markram looks to whip on the up but it takes the leading edge and Bhuvi pouches it at backward point. FOUR! The timing of this young man, I tell you. A full delivery, outside off, Markram crunches it through cover. For some reason... Shami looks tired. Burnt out even. Certainly doesn't look his real self.. the rhythm bowler who steams in and has the batsmen hopping. Bowled a lot of overs in the Ranji semi-final. Could that be a factor? Ishant didn't play for Delhi. This question will/should be asked. Shami is far, far away from his best. Was the same case in the Indian innings. Hardly looked threatning in his first spell. Concedes eight off this over. FOUR! Fetch that! Another short ball. 135kph. Elgar stands tall and pulls it through midwicket. FOUR! Short and into the body, Elgar pulls it late but it rolls away to the long leg fence. Hardik and Shami not troubling the South African batsmen at the moment. Wonder whether Ashwin would make a difference against Elgar. Only two off Pandya's over. After that boundary, Shami bowls a length ball which holds its line and Elgar gets beaten. Four off the over. FOUR! Was Rohit a bit too late to react? I think so. Elgar tries to run one down to third man but edges it. Rohit puts in the dive but is slightly slow. The ball falls short of him and races away to the fence. India need a special spell from someone to get back into the match. Here's a stat which will further create doubts for India's chances in the match. Only once has a visiting team won a Test in South Africa after conceding a 1st innings lead of 50-plus since their readmission in 1992. It happened when South Africa lost to Australia at Port Elizabeth in 1997. Elgar taps the second ball to point for a single. Markram after playing two dots scores a boundary. He again plays a good looking stroke on the final ball: a punch through backward point for a brace. FOUR! Pandya bowls it on a length and on the pads, Markram mvoes across a bit and clips it perfectly through midwicket. Hardik Pandya is into the attack. One run in the over before drinks. South Africa lead by 104 runs. 15 overs yet to be bowled and only 45 minutes of play is left. As exciting as this Test has been, the over rate from either side has been really poor. Markram and Elgar have settled down. Bhuvi did beat Markram on one occasion but beating the outside edges isn't going to help India's cause. Four runs came in this over. FOUR! 'Timing was immaculate,' says the commentator on air. Oh yes, it was. Again on the back foot waited Markram to punch it through cover. Conditions have changed from yesterday and South Africa will now aim to score big runs here and if India don't take two or three wickets by the end of the day then that's it for them as South Africa already a lead of 77 runs. Bumrah hits the deck hard. 140kph. Markram stands on his toes and defends it to point. His second ball is on a same length but it is on the fourth stump line, Aiden blocks it back to the bowler. Goes for a full delivery on the stumps, Markram clips it towards mid on for a single. On a length and outside off, Elgar waits and defends it off the back foot. The last two balls are dots. One off the over. Much improved showing from Bumrah. Bowling with the new ball has helped... has got purchase off the pitch as well. The biggest difference though is the line he has been bowling, much tighter in this second innings. Unfortunately, lady luck has gone to South Africa thus far. Action replays of Dhawan/Vijay dismissals for Elgar/Markram in the first two overs... only they didn't go to hand. The pitch has eased out a bit. If South Africa end the day unscathed, India would be in huge trouble. Good batting conditions at the moment and the Proteas are cashing in. The 7th over though was a maiden from Bhuvi. Eight off the over. Bumrah is looking to take wickets but is also leaking a few at the same time. FOUR! Markram is a lovely on the back foot. He stands tall and punches this through cover for his fourth boundary. FOUR! Bumrah bowls one on the stumps and Markram flicks it away to the midwicket fence. Ashwin gave it a chase only to come second. Jaffa! Bhuvneshwar bowls it in the fourth stump line and the ball leaves Elgar with the angle. The southpaw almost edged it behind. This is beautiful bowling from Bhuvi. A maiden. Elgar tucks the first ball to square leg for a single. Markram tries to block the second delivery but inside edges it past square leg for a double. Three off the over. One beautiful chance. One half-chance. Bhuvi is creating those chances and the slip cordon must be vigilant. FOUR! Bhuvneshwar bowls this on a same length and Markram goes for the punch again only to edge it behind. The edge goes over the gully fielder and races away to the fence. FOUR! Lovely shot to get off the mark with. Markram stands tall and punches it off his back foot. It's the debutant Jasprit Bumrah who has started the opening spell with Kumar and rightly so as Shami was not effective with the new ball in the first innings. In the air.... falls safely! Elgar, who scored a duck in the first innings, went for a pull and top-edged it. Shami gave it a chase but only manages to get fingertips to it. Huge miss this. Kohli isn't impressed. A better fielder could've converted this half-chance but Shami fails to do so. Two off the over. India vs South Africa, 1st Test at Newlands, Cape Town, latest update: Shami continues. This will be the last over of the day. Shami tries all the tricks in the bag even attempts a yorker but Rabada survives them all. That will be stumps on Day 2. Day 1 report: India's progress was checked late on Day 1 of the first Test in South Africa on Friday, with the tourists 28-3 at stumps and 258 runs behind on a tough batting surface. India lost both openers and captain Virat Kohli as they tried to limit the damage in the 11 overs faced before the close. Top-ranked India had rattled South Africa's batting lineup in the first skirmishes of a three-match series between Test cricket's top two teams. South Africa, who were 12-3 and in similar trouble at the start of the day, battled their way to 286 all out in their first innings. Bhuvneshwar Kumar's early blitz of seam bowling gave the Indians a promising start in another quest for a first series win in South Africa. Kumar, who finished with 4-87, sent back Dean Elgar, Aiden Markram and Hashim Amla in the first five overs of the series-opener. 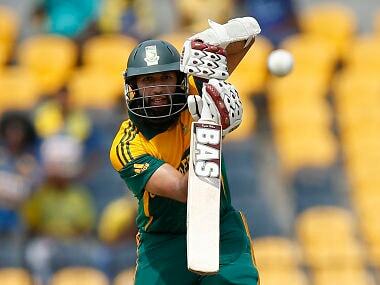 A middle-order century stand between AB de Villiers (65) and Faf du Plessis (62), and a lower-order rally pushed the South Africans near to 300. India's batsmen also struggled on the green surface in Cape Town. Murali Vijay went for 1, Dale Steyn returned to Test cricket for the first time in over a year to dismiss Shikhar Dhawan for 16, and Morne Morkel had Kohli for 5 with the first ball he bowled. Cheteshwar Pujara, on 5 not out, and Rohit Sharma, yet to score, took India to the close. "I would say it's even," Kumar said regarding the balance of power in the match. Those 11 overs at the end of the day gave an early glimpse of the battle that's predicted to define the series between the two teams: India's vaunted batting lineup against South Africa's fast bowlers. The Proteas picked four of those quick bowlers for the opening test, allowing Steyn, out for over a year with a right shoulder problem, to join Vernon Philander, Morkel and Kagiso Rabada in the four-pronged pace attack. Steyn had a wicket in his first spell back as Dhawan had a swipe at a short-pitched delivery and sent a catch swirling high up into the sky. Steyn took the catch off his own bowling. India's quicks had the first say, though, as Kumar exploited the generous bounce, swing and seam movement at Newlands that is normally designed to play into South African hands. He forced Elgar to edge behind with the third ball of the game, trapped Markram lbw with one that swung, and also had Amla caught behind. South Africa was saved by de Villiers and du Plessis, and a solid contribution from its middle to lower order. Wicketkeeper-batsman Quinton de Kock hit 43 off just 40 balls, and the tailenders all chipped in. "Obviously quite an intense day, but coming off after 6 o'clock, we are very happy," South Africa batting coach Dale Benkenstein said. "The guys fought hard. Those runs down there at the bottom, especially in tough batting conditions, really are vital." Kumar was India's best bowler, but debutant seamer Jasprit Bumrah and all-rounder Hardik Pandya made two crucial breakthroughs after lunch. With the du Plessis-de Villiers partnership threatening to completely spoil India's early progress, Brumah bowled de Villiers for a memorable first test wicket. Pandya worked hard for du Plessis' wicket, seeing an ultra-close lbw decision turned down via the decision review system before, two balls later, he forced an edge behind to dismiss the South African skipper. Du Plessis' exit was greeted by a running, fist-pumping celebration by India skipper Kohli. Kohli's own dismissal at the end of the day, when he nicked a short ball from Morkel, provoked an equally rowdy celebration from the South Africans. That intensity in the field may characterize a contest where India, clearly the best team in the world after nine straight Test series victories, is under scrutiny as it almost always is to prove it can win big series away from home. Of those nine successive series wins for India, six of them have come in India, and just one has been achieved outside Asia.